I won’t lie, it’s been a rather frustrating month moving about Papua and not really doing what I came out here to do, but things slowly seem to be settling down flying wise and I’ve finally managed to do something I’ve wanted to do for ages; swim with the local whale sharks. So it’s not been all bad really! No sooner had I arrived in Wamena a couple of weeks ago, I get a call from our operations department to say I need to ferry the aircraft back to Nabire again as we finally have some flying to be done from there. As per usual for life out here, it was a last minute thing and I “must to get to Nabire right now and fly a charter this afternoon!”. Luckily the weather has been fantastic lately up in the mountains, so it was no big deal to repack my suitcase and set a course west to Nabire. The charter in question was to Pogapa airstrip, home to John Cutts who sadly wasn’t there when I dropped in but it was nice to fly down The Freeway again and be amongst familiar territory. As it was rather late in the day, the I was a little concerned the winds at Pogapa might be rather testing but the high overcast layer was keeping a cap on the adiabatic effects and a steady 10kts tailwind was all there was making for a pretty straightforward approach and landing. Flying in Nabire is about as close to coming home as my life gets these days. It’s just so familiar to me now and I really wish we could find more flying contracts to keep me busy. I did a couple of charters last week to a couple of the usual airstrips (Enarotali, Duma and Dadou) but most of the flying lately has been to a small mining airstrip called Baya Biru. Baya Biru is around 330m with about a 7% up-slope and located in a steep sided valley about 50nm to the east of Nabire. Having not been there for almost exactly a year, I was curious as to the airstrip’s condition as I’d only ever heard helicopter traffic going in there lately. Aside from some rather long grass, the airstrip was actually in excellent condition and no problems at all for the Porter. After the first trip I asked the locals there to cut the grass before I returned the next day which they did and so began a week of flying there a couple of times a day. I’m just glad we’re actually doing some flying from Nabire again as it’s been months and months since we last did any! Oh and for those people wondering about the above picture; it was taken with a Garmin VIRB Elite action camera which allows for some pretty awesome telemetry on flying videos. Stay tuned #avgeeks for some new footage with all this extra information on it! The real treat of the past couple of weeks however has been swimming with some of Nabire’s biggest residents, whale sharks. 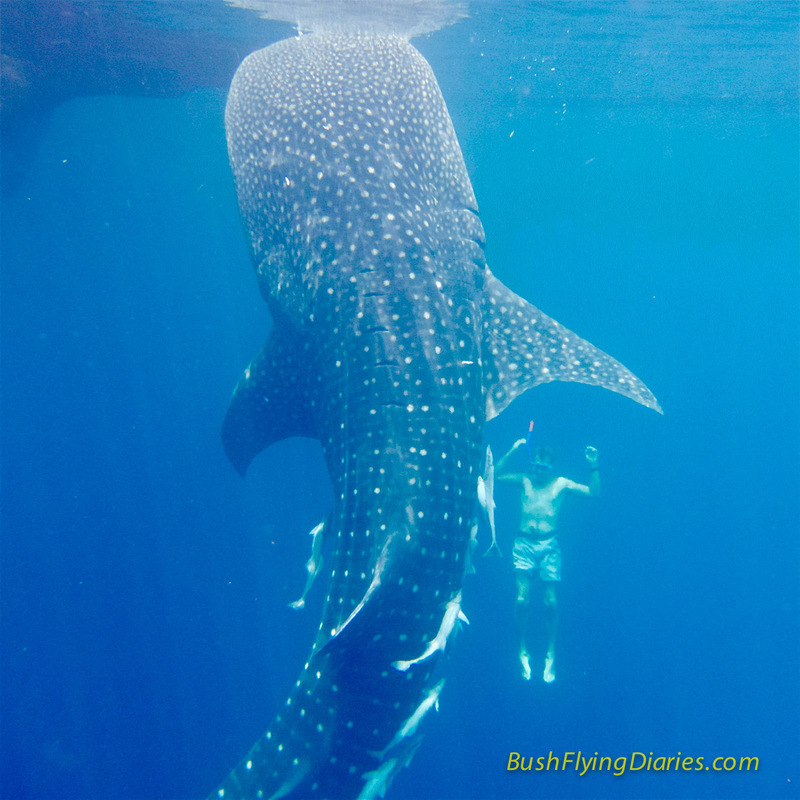 Now I’ve actually swum with whale sharks before in Cebu in the Philippines but that was a very touristy affair and almost like swimming with domesticated animals. The ones here in Nabire are wild and it’s hit and miss you’ll actually find them but luckily we did. One of our company drivers is friends with some of the local Nabire fishermen, so last Sunday we had arranged for them to take a small group of us from one of the beaches out to the north west where the whale sharks are known to inhabit. It was a bumpy two hour boat ride to the first of many floating fishing platforms which the locals live on for months at a time. Chatting to the fishermen it seemed we had missed them as they’d already swum away, so we moved onto the next fishing platform. After around three or four platforms, we eventually found a nice 5m whale shark and with a little trepidation, jumped into the water. 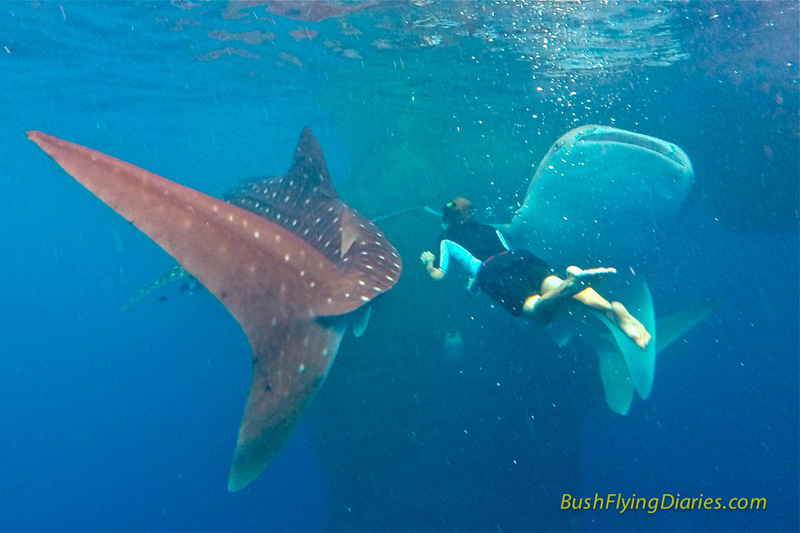 We needn’t have feared anything for despite their namesake, whale sharks are not interested in us humans as dinner. They prefer small fish which the local fishermen willingly supplied for a small fee to keep the giant fish around whilst we frolicked with them. 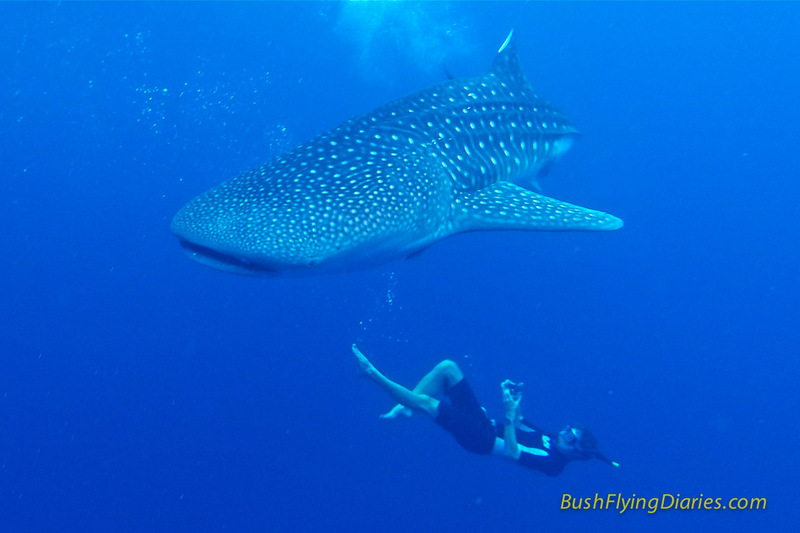 A second even bigger whale shark appeared soon after our arrival as the icing on the cake to an amazing experience and one I certainly won’t forget in a hurry. In Bahasa Indonesia we say: KEREN! Utterly brilliant blog, a great read. Only an arm chair pilot but my passion for aviation is huge,great to read about people living the dream. My very best wishes to you. Could you please let me know why you chose the Garmin VIRB as the action cam? I am in the process to select a good action cam for flying and I would very much appreciate your thoughts. Do the GoPros lack the possibility to link telemetry data? Also, does your Garmin action cam links up with the Garmin stuff onboard or is there some other method? As far as I know the Garmin VIRB range is the only ones that offer the telemetry overlays. I think the very latest models (both cameras and avionics) do allow some kind of linking together. The camera does of course link to any iPhone or Android phone for full control.